The 2019 spending plan for the Department of Homeland Security (DHS) includes numerous rules that will help Democratic legislators and activist groups stigmatize and choke immigration enforcement before the 2020 election. The strategic landmine is buried under numerous demands for reports that will be leaked to the media, directions for border officials to cooperate with pro-migration groups, and demands for data that may be used by pro-migration lawyers to block enforcement actions. The Democrats’ chief target is the U.S. Immigration and Customs Enforcement (ICE) agency, which many migrant-first Democrats wish to defund because it curbs the inflow of migrants. 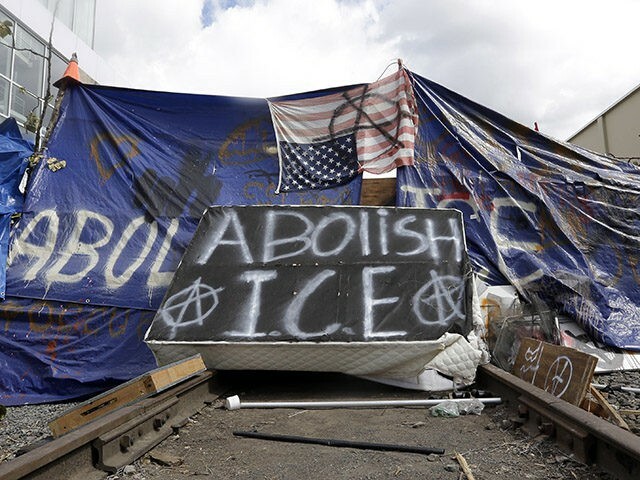 The anti-enforcement push, dubbed ‘Abolish ICE!,” was boosted by the 2018 election of many progressive Democrats. The pro-migrant agenda of these Democrats is included in the legislation. These attacks on ICE enforcement are complemented by expensive programs which aid migrants who cross the border in search of jobs, or which fund U.S. pro-migration groups. And this, regarding how Border Patrol counts deaths of migrants it encounters in the field. The Democrats’ push to stigmatize enforcement is being justified as a reaction to the deaths of two children who died as their parents brought them across the border. But the Democrats’ anti-enforcement plans will encourage more migration, more deaths, and will impose more cheap-labor migration on American families and children. The conferees direct [U.S. Customs and Border Protection] CBP to provide the Committees with data pertaining to the number and efficacy of roving patrol stops and to release this data publicly on a semiannual basis, including a description of CBP policies governing enforcement actions of this nature; the total number of roving patrol stops made by CBP personnel, including the number resulting in arrest; and the date, location, duration, type of, and reason for each roving patrol stop and each resulting arrest. All personally identifiable information about specific individuals shall be redacted from these reports. Within 90 days of the date of enactment of this Act, ICE is directed to brief the Committees on its plan and schedule for completing its ongoing evaluation of the potential use of body worn cameras in its field enforcement activities. The conferees note that CBP has evaluated the use of body worn cameras in its operations and encourages ICE to coordinate with CBP on lessons learned. The Department shall continue to submit data on the deportation of parents of U.S.-born children semiannually, as in prior years, and shall also report semiannually on removals of honorably discharged members of the armed services. The conferees encourage ICE to work with appropriate nonprofit organizations and victim service providers to improve the training of ICE officers in the field to assist in the identification of human trafficking victims and provide appropriate referrals to victim service organizations. ICE is directed to ensure that every 287(g) jurisdiction has established, and routinely and formally meets with, steering committees of external stakeholders to discuss the performance and oversight of 287(g)-designated officers. ICE shall continue to provide an annual 287(g) report, as detailed in House Report 115-239, which should also describe any plans for future expansion of or changes to the use of its 287(g) authority. ICE is directed to ensure that access to “know your rights” presentations is available at the point of enrollment for all ATD [Alternatives to Detention] programming, and to explore opportunities to work with community-based organizations that directly provide case management services, including referrals to services already available in the community that are associated with higher ATD compliance rates. ICE shall brief the Committees not later than 60 days after the date of enactment of this Act on any challenges it encounters to achieving this requirement. The legislation also increases inspections of detention centers, indirectly possible ammunition for providing lawyers. The bill was drafted by a panel of 17 GOP and Democrat legislators who sit on the House and Senate appropriations committees. However, none of the GOP members on the panel are immigration experts, while the Democrat side included several legislators who are determined to raise the inflow of migrants. This imbalance allowed the Democrats to compromise on some major funding issues — such as funding for a border wall — while snatching political wins by quietly imposing pro-migration policies. Following the recent deaths of [two] migrants in custody, CBP promulgated new interim standard operating procedures to improve the agency’s awareness of migrant welfare and response to emergency situations. CBP is directed to brief the Committees, within 60 days of the date of enactment of this Act, on its progress in establishing more permanent plans, standards, and protocols, to include the following: health assessment standards and response protocols for medical emergencies, including transportation between CBP locations and to hospitals or other medical response sites; requirements for ensuring that CBP provides water, nutrition, hygiene, and sanitation needs of migrants in temporary CBP custody; standards for temporary holding facilities that ensure such facilities are humane and used appropriately for single adults, families, and unaccompanied children; protocols for responding to surges in migrants cros,sing the border; and a plan for providing training to federal and contract personnel who interact with migrants in CBP custody. As part of the briefing, CBP shall also present a schedule for finalizing and implementing these plans, protocols, and standards; estimates of the associated short-term and longer-term funding requirements; and any changes to legal authorities that might be necessary. As previously directed in House Report 115-239, CBP shall continue to report to the Committees the following: the number of detainees held by CBP for more than 48 and 72 hours, respectively; allegations related to employee corruption and use of force abuses; and checkpoint, transportation check, and roving patrol stop operations. This information should be updated monthly and should include a list of all CBP facilities used for temporarily detaining aliens, including the year-to-date average daily population and the daily population at these facilities at the time of publication. Within 90 days of the date of enactment of this Act, CBP shall brief the Committees on its search and rescue efforts for fiscal year 2018, as detailed in House Report 115-239, with a particular emphasis on the Border Patrol’s policies, methodology, and oversight related to how migrant deaths are counted. Additionally, CBP is directed to report the death of any individual in CBP custody, in the temporary custody of other law enforcement agencies on behalf of CBP, or subsequent to the use of force by CBP personnel within 24 hours, including relevant details regarding the circumstances of the fatality. Democrats argue that the United States is a land of and for immigrants. The support for migrants helps Democrats to ignore the economic and civic impact of mass migration on Americans, including on poor Americans who vote Democratic. That Democratic focus on migrants helped persuade voters to put a pro-American TV personality and real-estate investor into the White House in January 2017. The federal government uses both legal and illegal migration to boost economic growth. That policy also shifts enormous wealth from young employees towards older investors by flooding the labor market with cheap white-collar and blue-collar foreign labor. The annual inflow of roughly one million legal immigrants — as well as the population of two million visa workers and eight million working illegal immigrants — floods the labor market as 4 million young Americans enter it each year. The flood spikes profits and Wall Street values by shrinking salaries for 150 million blue-collar and white-collar employees, and by lowering starter wages for the four million young Americans who join the labor force each year.